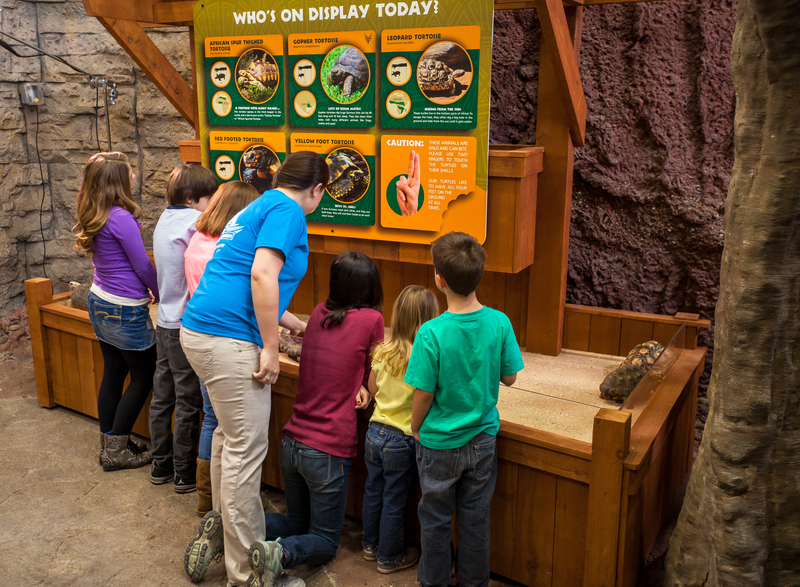 In case you did not hear the big news, Newport Aquarium’s newest exhibit Turtle Canyon opened to the public on Saturday, March 22! 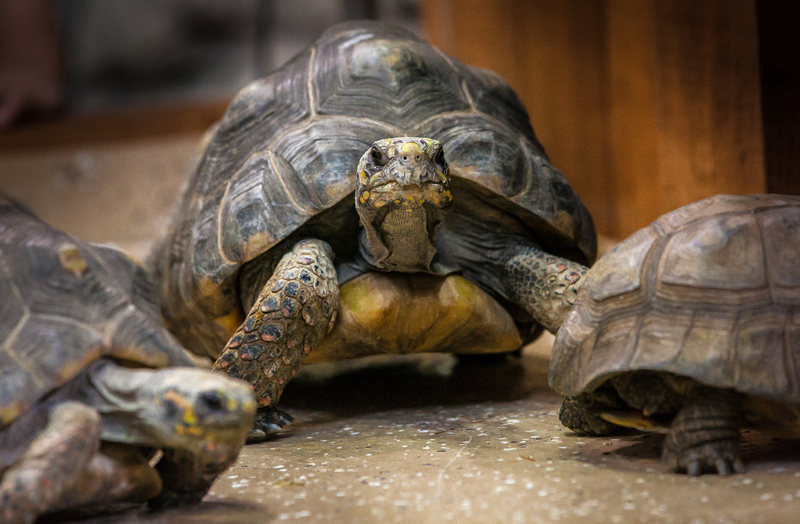 In addition to Bravo, a 650-pound Galapagos tortoise and the Midwest’s largest turtle, and Thunder, a 118-pound and over 100-year-old alligator snapping turtle, one of the most distinctive features of Turtle Canyon is its Turtle Corral. 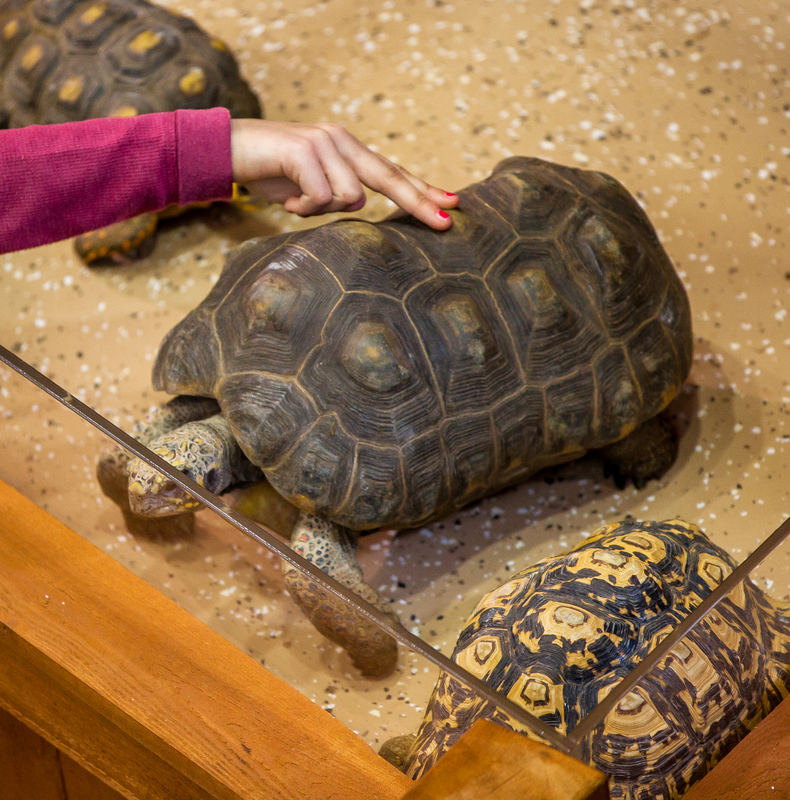 The Turtle Corral offers guests the unique opportunity to get up close and personal by touching a variety of turtles. On any given day, up to five species of turtles at a time can be found at the Turtle Corral. African Spur Thigh tortoise – The third largest tortoise species in the world. Gopher tortoise – A Flagship species for conservation and preservation of Longleaf Pine habitat in the Southeastern United States … one of four native tortoises to live in North America. Leopard tortoise – The Leopard Tortoise is the fourth largest of the tortoise species and is considered vulnerable in parts of Central and South Africa due to consumption by the locals. Red-footed tortoise – Medium-sized tortoise whose natural habitat ranges from Savannah to forest-edges around the Amazon Basin. 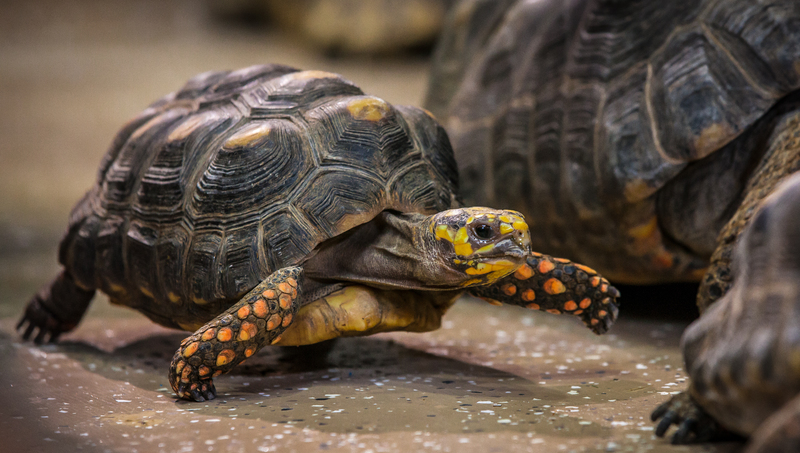 Yellow-footed tortoise – The third-largest mainland tortoise species, also found in the Amazon Basin of South America. Don’t worry; we don’t have the same turtles in the corral every day. To ensure the turtles receive time away from the exhibit, a group of over 20 turtles are in the Turtle Corral rotation. This means guests can conceivably see different turtles at the corral practically every time they visit! Like Newport Aquarium’s Shark Central and Shore Gallery touch experiences, guests are encouraged to employ the two-finger touch technique at the Turtle Corral. Guests should only touch the turtles on their shells. Guest should refrain from touching a turtle’s legs, tail and/or head. Guests should never pick up or move a turtle. If a turtle is out of reach, it should not be picked up and moved. Please allow the turtle to have some “Time Out” time. 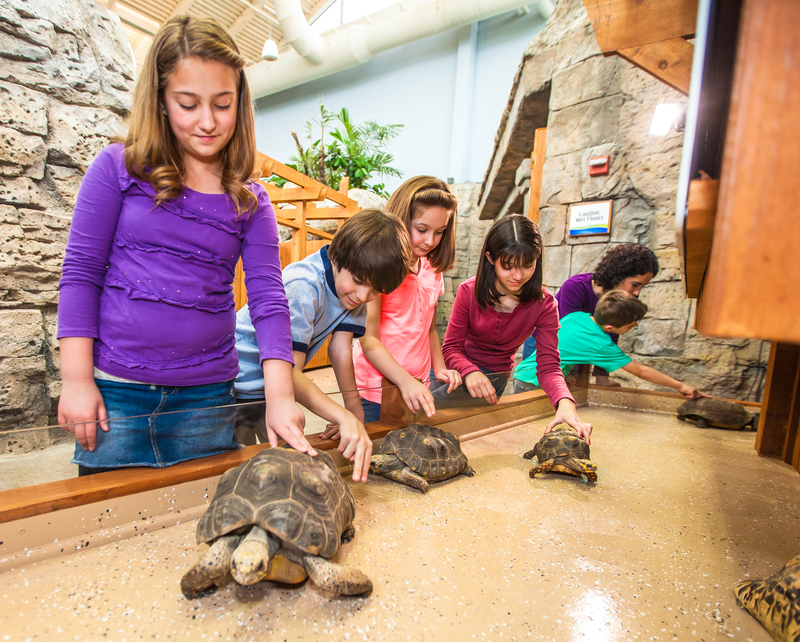 Guests are strongly encouraged to use hand sanitizer before and after they are finished touching the turtles. Hand sanitizer is located all throughout Turtle Canyon, as well as the rest of the aquarium. For guests with questions about the Turtle Corral, a trusty Newport Aquarium Animal Experience Specialist will be stationed nearby to answer them. We hope those who visit Turtle Canyon and experience the Turtle Corral come away with a greater understanding and appreciation for turtles of all species, which totals over 200 in the world. This entry was posted in Turtles and tagged Turtle Canyon, Turtle Corral, turtles, TurtleTuesday by NewportAquarium. Bookmark the permalink. Hi! I have been trying to contact someone there about getting permission to use a picture of Tilly in a story we want to do about our Emerald Isle Sea turtle Protection Program . I have tried messaging your Facebook page, commenting on your turtle blog, and emailing your contact from your website. Can you tell me who I should talk to? My name is Sharon Lewis, and I am the volunteer who brought Tilly into the Aquarium in Pine Knoll Shores the morning after we excavated “her” nest. Jim Craig, who heads up the program in Emerald Isle, asked me to contact you guys. He would like to write an article that follows up on our efforts with the nests and hatchlings. We want to properly acknowledge the source of any pictures we use. I hope you can help me, or point me in the right direction! Thank you.